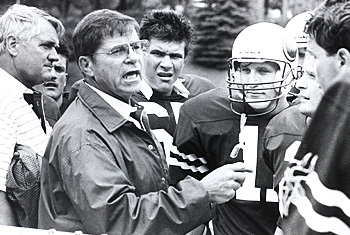 Former Lawrence University athletic director, long-time football coach and Professor Emeritus of Physcial Education Ron Roberts passed away Sunday, Dec. 2 in Oshkosh. He was 81 years old. An icon in the annals of Lawrence athletics, Roberts joined the athletic department in 1963 as the football team’s offensive line coach under another Lawrence legend, Bernie Heselton. Roberts also coached the wrestling and men’s tennis teams upon his arrival on campus. He later served as athletic director for many years, overseeing the introduction and expansion of varsity sports for women. Named head football coach in 1965 — the year the Banta Bowl opened — Roberts won his first of six Midwest Conference championships the following year, compiling a 7-1 record. In just his third season, the 1967 squad finished 8-0, becoming only the fourth unbeaten/untied team in school history en route to another conference title. Roberts’ teams would go on to win Midwest Conference titles in 1975, 1979, 1980 and 1981. Gracious in victory and uncomplaining in defeat, Roberts posted 14 winning seasons in his 20-year football coaching tenure. During an impressive 10-year stretch (1974-83), the Vikings never lost more than two games in a season and posted a 77-15 record that included a school-record 18-game winning streak. The 1981 season was arguably the pinnacle of his coaching career. Lawrence won the Midwest Conference championship and finished with a 9-0 regular-season record, becoming the first Midwest Conference team selected for the NCAA Division III playoffs. The Vikings became the first Midwest Conference team to host and win a NCAA playoff game, defeating Minnesota-Morris 21-14 in overtime. Lawrence reached the NCAA national semifinals, the only Midwest Conference team ever to advance that far in the Division III playoffs. A tireless recruiter and an unabashed optimist, Roberts stepped away from football after the 1983 season but returned as the team’s head coach for a final season in 1992 before retiring. When he ended his football coaching career, he had amassed the second-most wins in the history of the Midwest Conference. He owns the Lawrence school record with 121 victories and his 121-54-1 record upon retirement was the 12th-best winning percentage (.690) in NCAA Division III football history at the time. Nearly two dozen players who played for or were recruited by Roberts earned all-America honors. He coached the wrestling team for 19 seasons in three different stints (1963-69, 1972-74, 1985-93) and the men’s tennis team for six seasons from 1964-69. His 1968 tennis team won the conference championship. A charter member of Lawrence’s athletic Hall of Fame, Roberts also was inducted into the Wisconsin Football Coaches Association Hall of Fame in 1996. Born in Chicago, Roberts was a standout football player and wrestler at the University of Wisconsin. He helped the football Badgers reach the 1953 Rose Bowl and was selected as an alternate to the U.S. wrestling team for the 1956 Pan-Am Games in Mexico City. Roberts earned a bachelor’s degree in history and physical education and a master’s degree in educational administration from Wisconsin, an advanced degree from the University of Chicago and a Ph.D. in educational administration from Brigham Young University. He began his coaching career at his high school alma mater, Crane Tech, taking over a program that had not won a game in three seasons before he arrived. Roberts’ first team won a divisional championship and advanced to the city playoffs three consecutive years under his guidance. He also coached three seasons at East Leyden High School in suburban Chicago before coming to Lawrence. He is survived by his wife, Marlene, three children: Ron Jr. ’84, Appleton; Carrie ’86, Lombard, Ill.; and Elizabeth (Fredrick) Leijonhufvud, Stockholm, Sweden; and two grandchildren, Lovisa and Matilda. A visitation will be held Friday, Dec. 7 from 4-8 p.m. at Wichman Funeral Home Tri-County Chapel, 3212 S. Oneida St., Appleton. A celebration of Ron’s life will be held Saturday, Dec. 8 at Calvary Bible Church, 1450 Oakridge Road, Neenah. Visitation at 1 p.m. until time of service at 2 p.m. Burial will be at Kingston Cemetery, Prairie du Sac, Wis.
Memorials can be directed to the Lawrence University Athletic Department, 711 E. Boldt Way, SPC 18, Appleton, WI 54911 or the Charcot-Marie-Tooth Neuropathy Research Association, P.O. Box 105, Glenolden, PA 19036. Founded in 1847, Lawrence University uniquely integrates a college of liberal arts and sciences with a world-class conservatory of music, both devoted exclusively to undergraduate education. It was selected for inclusion in the Fiske Guide to Colleges 2013 and the book “Colleges That Change Lives: 40 Schools That Will Change the Way You Think About College.” Individualized learning, the development of multiple interests and community engagement are central to the Lawrence experience. Lawrence draws its 1,450 students from nearly every state and more than 50 countries. Follow Lawrence on Facebook.